For my 22 before 23 birthday list, I made a goal to cook 22 recipes from 22 places. I started by making a list of countries where I either liked the food or knew nothing about the food. The point of this goal is to learn new things about ingredients and cultures while trying to improve my cooking skills. See past recipes here: 1, 2, 3, 4, 5. Since St. Patrick's Day is coming up, I really wanted to try making something from Ireland. 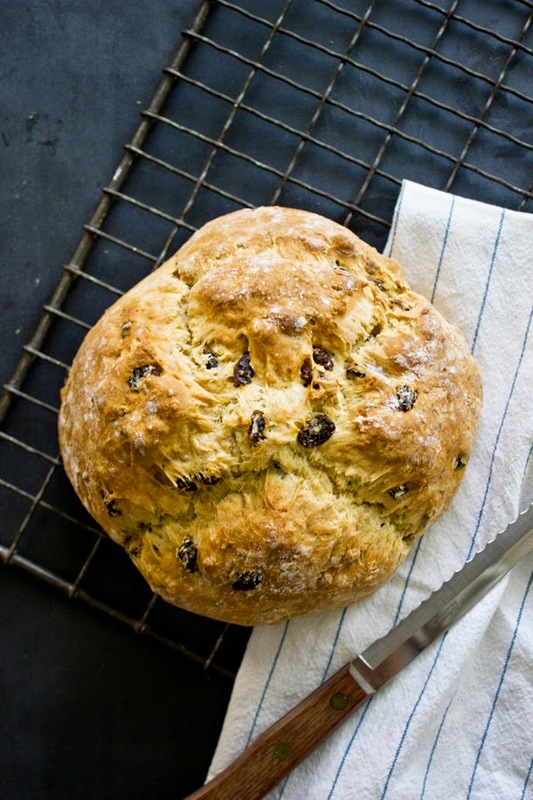 I remember trying Irish soda bread last year on St. Patrick's Day and loving it. I found a recipe online and it didn't seem too complicated, so I thought I would give it a shot. It turns out it was really easy! Preheat oven to 375°F. 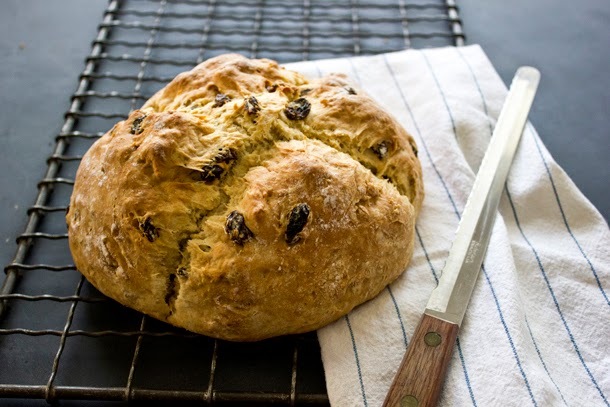 In a large bowl, combine the flour, sugar, raisins, baking powder, baking soda, and salt. Then add the butter and cut it in with a pastry blender until the mixture is crumbly. In a small bowl, beat the egg lightly and mix in the buttermilk. Add the egg and buttermilk to the dry ingredients. Turn out the dough onto a floured board or use a greased bowl in the stand mixer and knead for 2-3 minutes until smooth. The dough will be sticky. 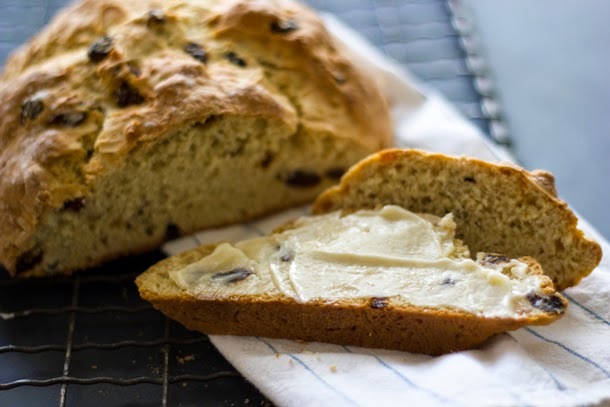 Divide the dough in half and form two round loaves. Place on a greased cookie sheet or cast iron pan and bake for 40-45 minutes. Originally, I made my bread on a cookie sheet, but I think I'll use a cast iron pan next time to keep my bread round. 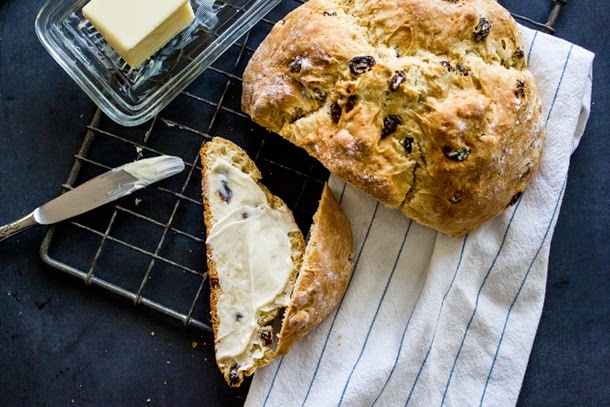 This bread is so good served warm with a good amount of butter!